After our Les Voiles celebration, we had to headed back up to St. Maarten to see a man about a chain. Matt ordered 100 meters of G50 stainless, small link to replace our 100 meters of G3 galvanized (that is only 3 years old but has several spots that missed the galvanization process). He found the new chain in London for 1/3 the price which was a bargain even when you include shipping. 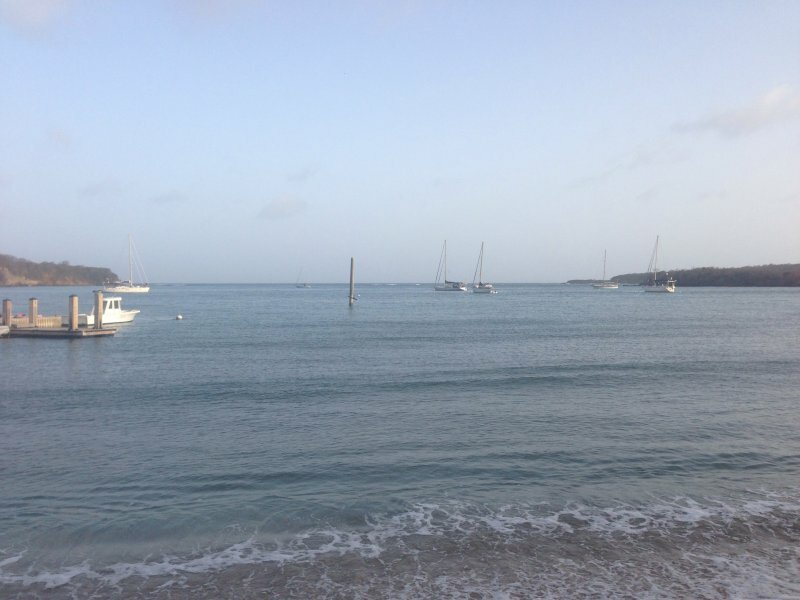 We had hoped it would arrive before 15 April, but there was a mix up with the multiple transport people and somehow it never made the boat from MIA to SXM. So, we decided to make the best of this tip by provisioning and running some errands. First, we had to offload our extra PVC sheets that we didn’t use from the ceiling project. We kept several pieces of PVC for other projects, but still had (3) 4′ x 8′ pieces and lots of scraps taking up half of the port side cabin. 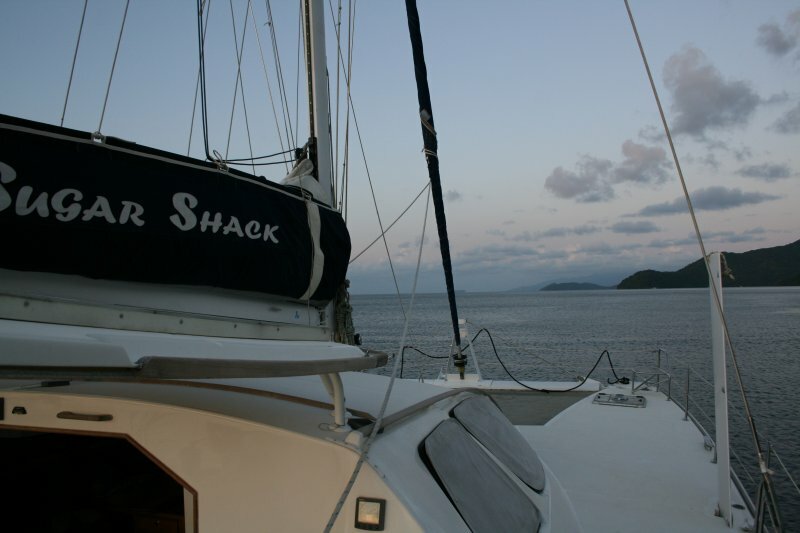 So we loaded them into the dinghy, sprawled across the sheets from bow to stern to prevent them from blowing overboard, and took off to Marigot (from Simpson Bay). It is a pretty far dinghy ride, and in the wind, with these huge sheets it took us even longer. All our muscles were tight and cramping by the time we pulled up to Custom Fit Marine. 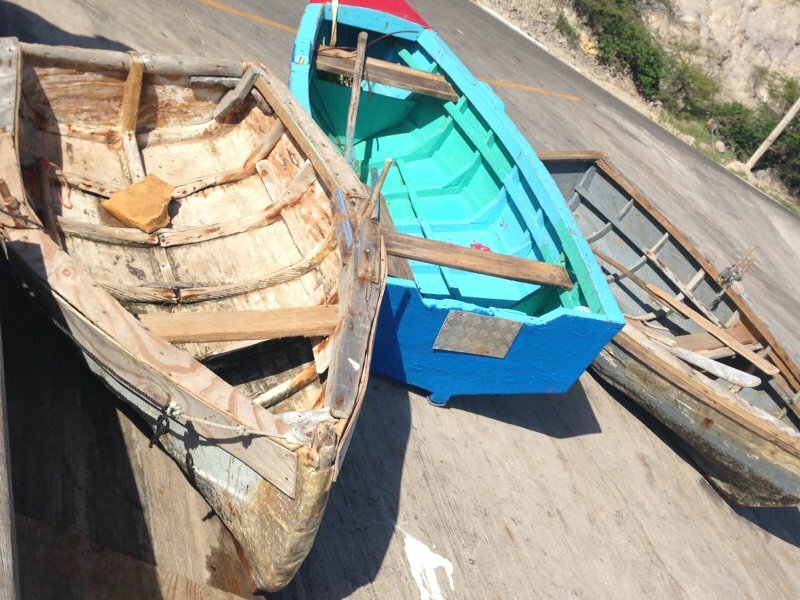 We could not find the original fellow who was interested in taking them, but one of his partners took a look and decided to keep them – good thing as there was no chance in hell we were going to take them back to the boat. We quickly left before he could change his mind and headed to PDP marina where our friends Contrary Mary were birthed to return some tools that we had borrowed for our ceiling project. After a short visit, we headed up the hill to Carrefore for our first grocery run. Loaded down with several bags, we walked the 1/3 mile back to the dinghy and headed to the boat to unload. Round II, we grabbed our dolly and headed back to shore and up the hill. Matt diverted to Island Water World in search of a water pump part for our friends on El Gato while I headed to Ace Mart to pick up some rugs. We met at the top of the hill and walked to Divico (think Costco or Smart and Final) and picked up water, cold beverages, snack items, and some toiletries. We dumped everything in the dinghy and had a well deserved beverage at Lagoonies. Matt headed to Electec to grab some cable for our new security camera and to Budget to find the part that was not at Island Water World while I stood guard of our goodies. I quickly got bored and decided to swing up to Tropical Sail Loft as they were ordering some material for me (Sunbrella and Phifertex). I checked in, got some samples, and headed back to my post. Matt returned and we both headed up to Prime (another Costco type place with different options) and picked up some beer and ribs in large quantities!!! 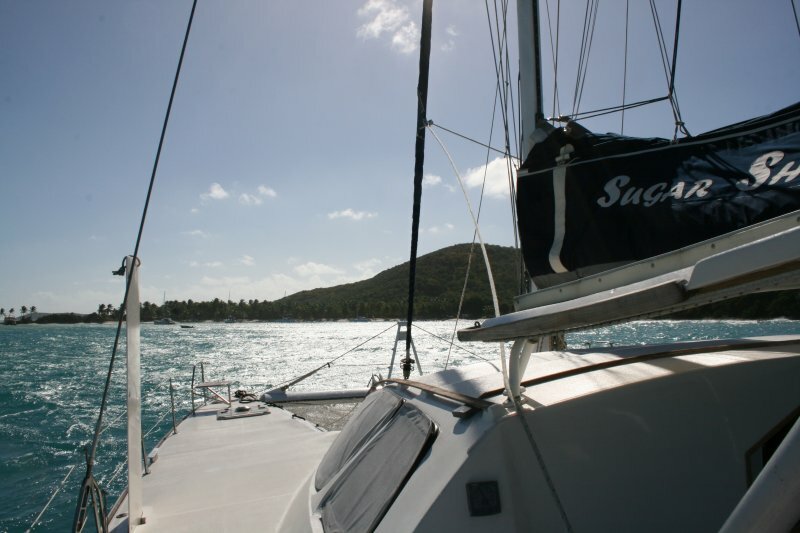 Back to the dinghy and then the boat to unload all of our treasure. After a short rest, and some emails with El Gato, we headed back for round III. We stopped at Customs/Immigration to drop trash (not there but close to it) and to clear out of SXM. As Matt was checking out, I walked to town to get some diet gingerale at the Green store, swung into Booze it Up to check out pricing on vodka and rum, and hit the pharmacy to get Advil (they don’t sell medicine of any type in the grocery store on island, you have to go to a pharmacy even for basic things as ibuprofen. Matt and I were meeting at the IGY dinghy dock and as I walked up with my 4 boxes of diet gingerale and advil, I noticed Matt was talking up Anna! I love that we keep running into our cohorts. Steve and Kat (his new crew) showed up shortly after. We couldn’t stay long as we had to hit Island Water World to get the part for El Gato and then have a quick toddy with Contrary Mary. Well, it had been awhile since we had caught up, and one drink turned into two. Without much food in us, it quickly turned silly so we headed back to the boat for some chow and rest before our journey to Antigua. 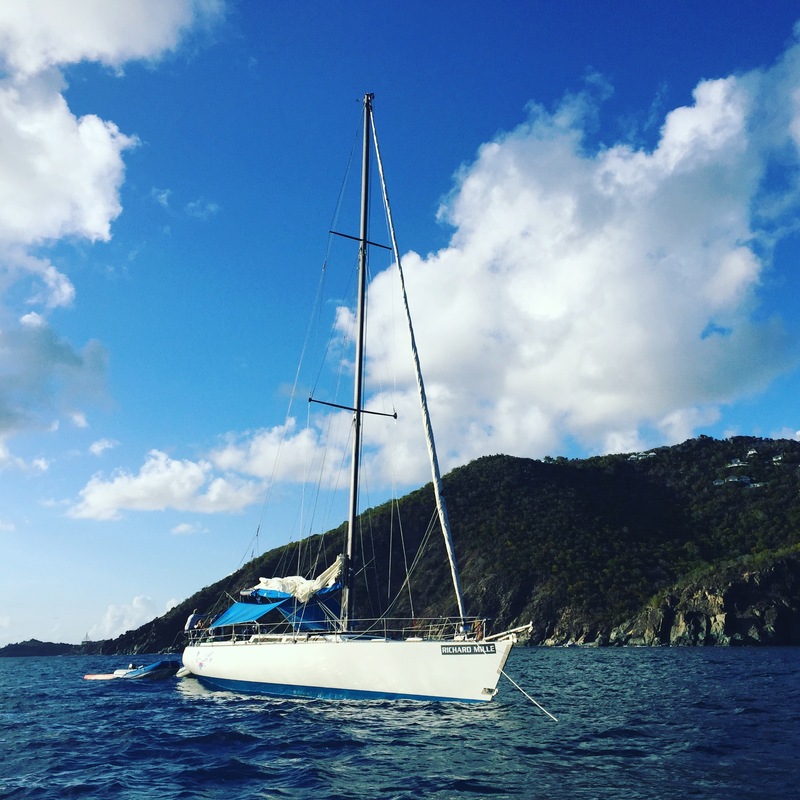 Gone are the days you could drive to each place, lots of walking, loading, and lugging heavy items from the store to our dinghy – but this is a small price to pay to live in paradise. 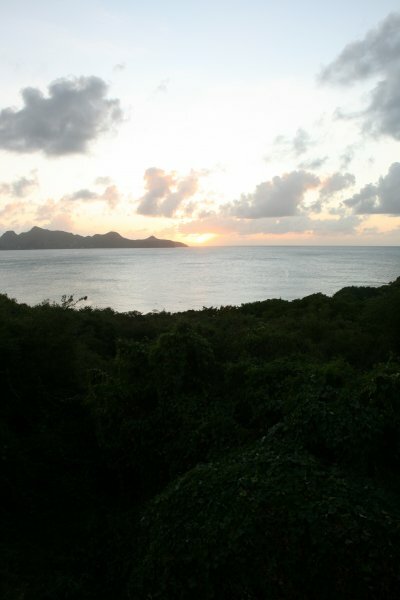 Luckily, St. Maarten is a great place to provision, reasonable prices, lots of variety, and plenty of options. This entry was posted in Caribbean on April 28, 2017 by Christine. 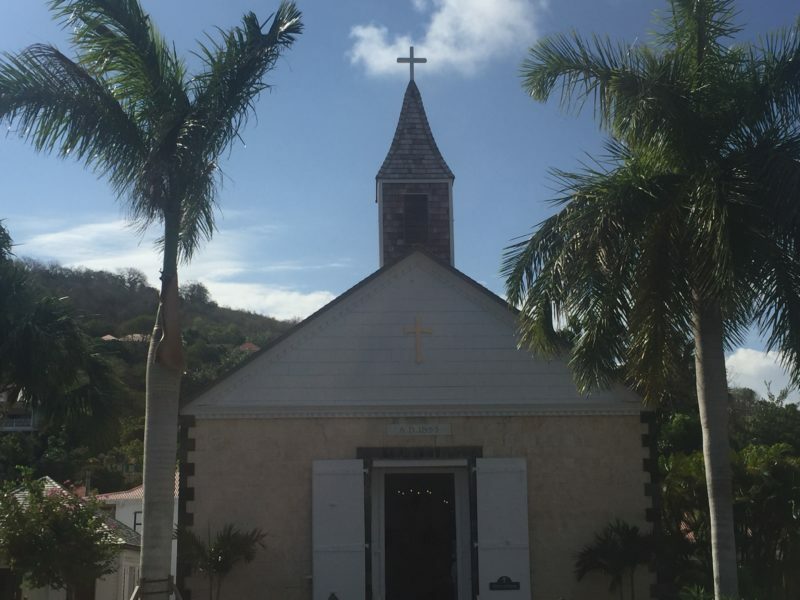 St. Barth is a predominately Catholic and yet Gustavia, the capital, only has one church which holds services the 2nd and 4th Sunday of each month. Well, that did not exactly coincide with Easter (being the 3rd Sunday this year). So, I was off to find a church, preferably in English to celebrate this Easter Sunday. Right off the main docks is an Anglican Church called St. Bartholomew’s Anglican Church and it looks super cute, has service at 9am, and is in English. Sweet, done! I arrive a little after 830a to ensure I get a seat in side (it is really a small church that holds about 150 people and is elegant in its simplicity.) It has 3 large swinging double doors that are over 20′ tall on each side of the church (making it indoors/outdoors), and they have no full time priest. They fly priests in from all over the world to provide service (they stay 4-5 weeks at a time). 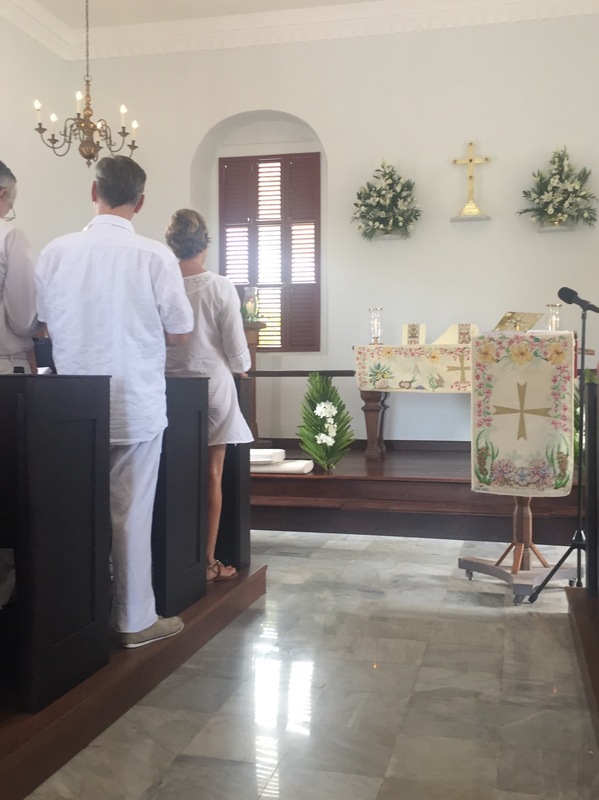 So, I am on a French island, with a Priest visiting from Ontario, we sing a Peruvian version of “Glory”, and I am surrounded by 98% Caucasian, well to do, upper class, well dressed parishioners. The Brazilian next to me came with a “small part of his family”, but still managed to fill 3 pews. There are well over 200+ people here that are spilled out on the lawn, outside the double doors, and adjacent the church, it is packed. Just as the priest began his sermon, a small bird began chirping and then flew in from one of the large double doors on right side of the church and out the left side of the church. It so made me think of my mom. The choir, dressed in all white, singing from iPads rather than choir hymnals, began to sing “Amazing Grace” – always brings tears to my eyes. It was a beautiful celebration where people got out of their pews to shake hands to wish “peace” to others. Hope you all had a lovely Easter celebration as well! This entry was posted in Caribbean on April 25, 2017 by Christine. 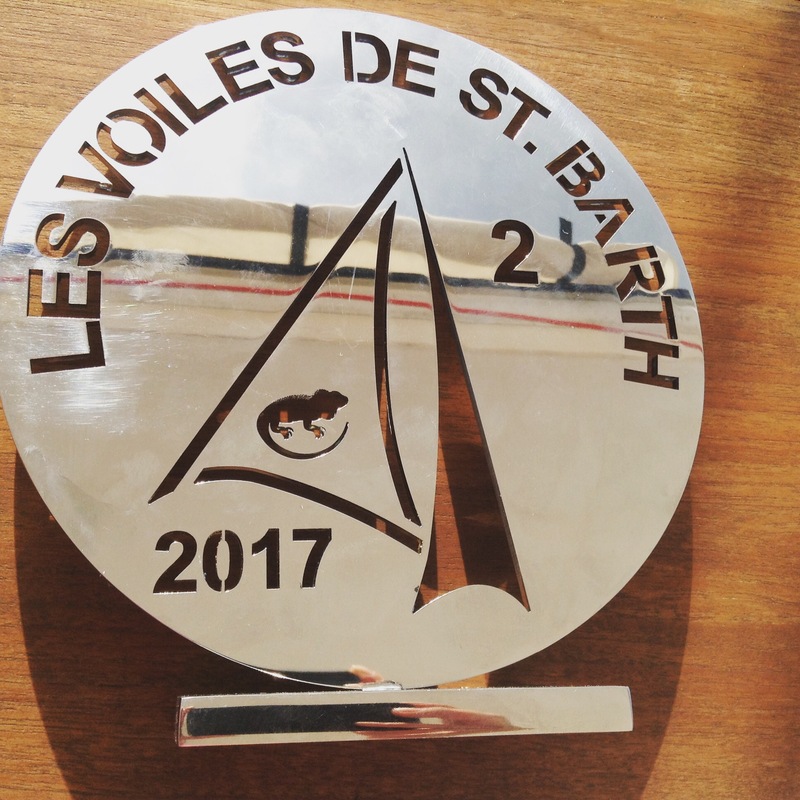 Two days before Les Voiles de t Barth was to start we received a message from our good friend Chip Spence who lives in Texas. 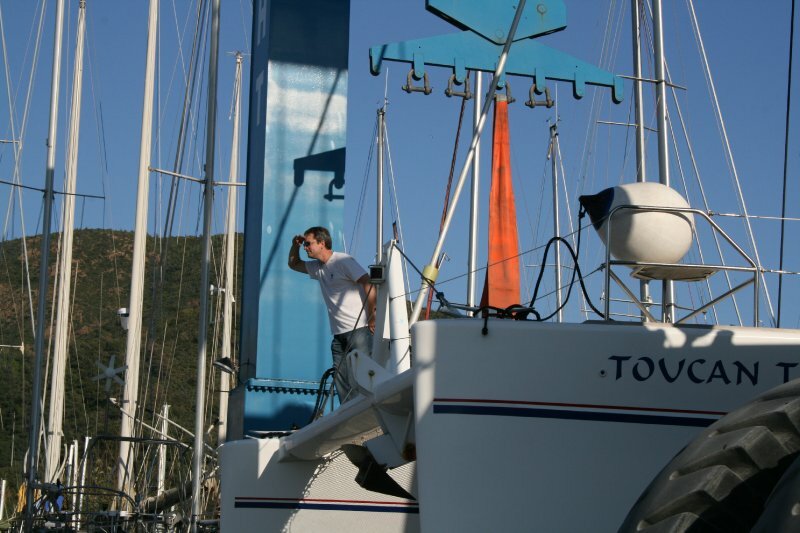 He caught in article in Latitude 38 magazine written by Richard Spindler (who was the founder and creator of the publication and is still in author of many articles), which stated he was in search of crew on a Santa Cruz 70, Hotel California too, for the Les Voiles regatta. What! I jumped up and down and asked Matt, can we, can we please reply and ask to join this crew? 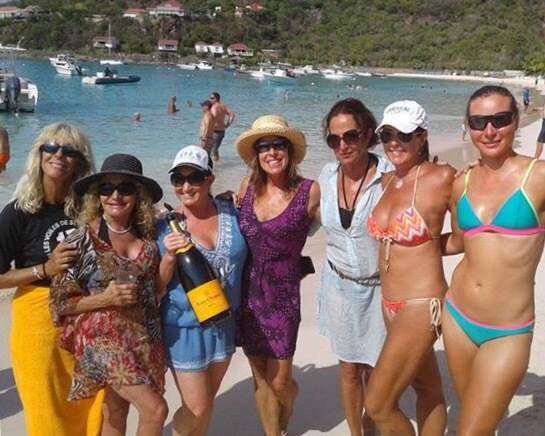 We had participated in many races with our dear friends from Texas (mostly on Donald’s beautiful yacht Ruthless), but had never participated in a professional regatta in the Caribbean. 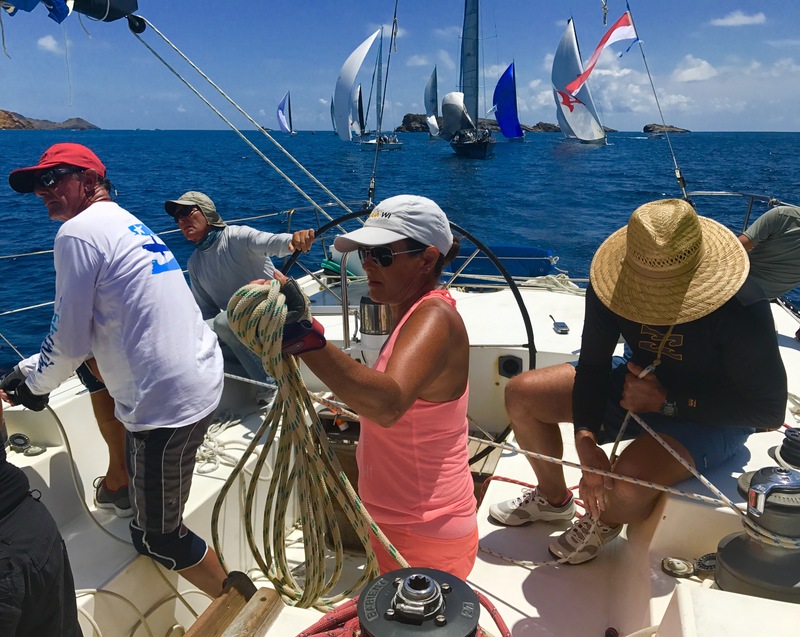 As you know, we have been huge spectators and cheerleaders during the Heineken Regatta, Antigua Race Week Regatta, and St. Barth’s Bucket for the last few years, but have never actually raced. He acquiesced, and I fired off an email before he could change his mind. I included our race history, our sailing yacht, the fact that Matt had his Captain’s license, and that we were already on island. I also included a super cute photo of us. 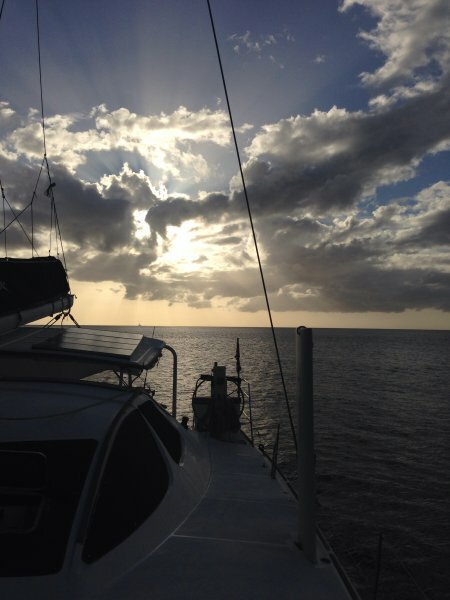 Richard responded immediately saying “we were in.” I’m thinking, wow, just like that we are crew on a 70′ boat – cool! 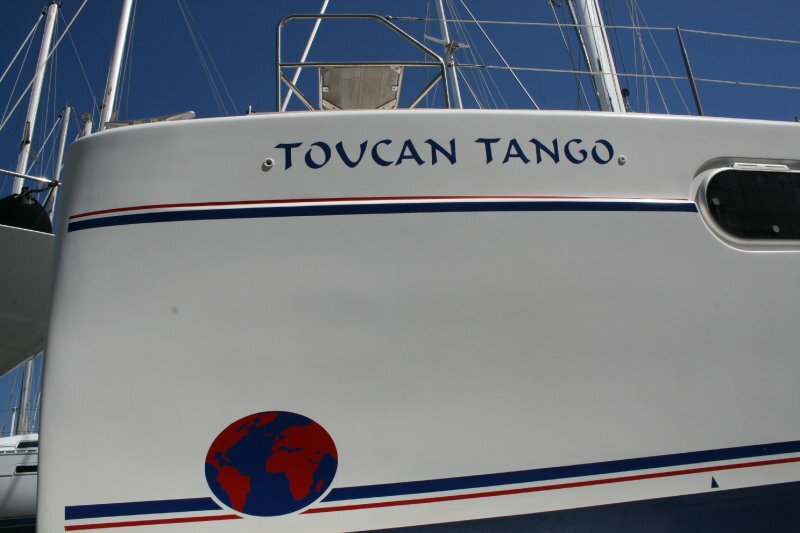 He informed us that another couple on a Catana 47 will be joining us and low and behold it’s a couple we met last year, Eric and Annie from El Gato. Richard and I bounced a few emails around and decided to meet the next day. 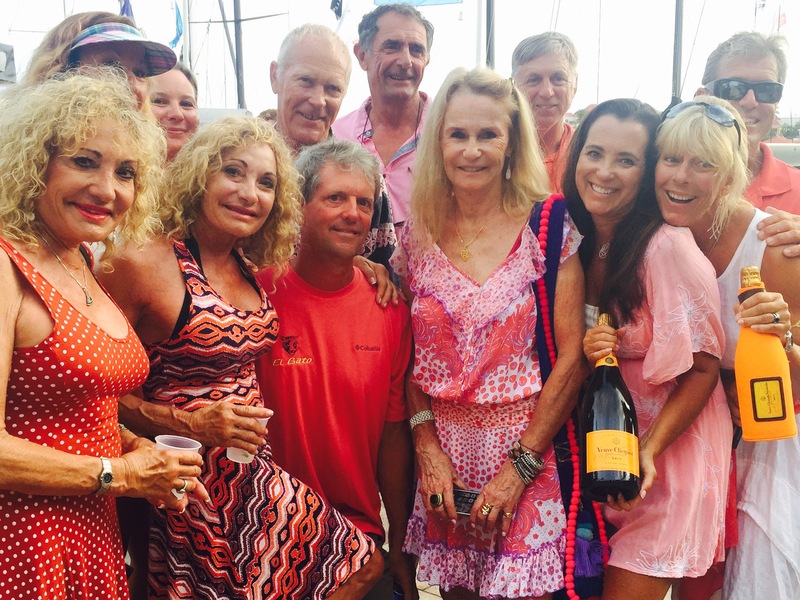 The entire crew was to meet at the opening party to sign the crew list and get acquainted. We met Steve, the owner of Hotel California, Richard & Dona, Anna Sepko, Annie & Eric, Steve & De, Barbara, Jen, Marie-Claude, JJ, and the rest of the crew. There were 17 people signed up for the first day – that’s a big group! 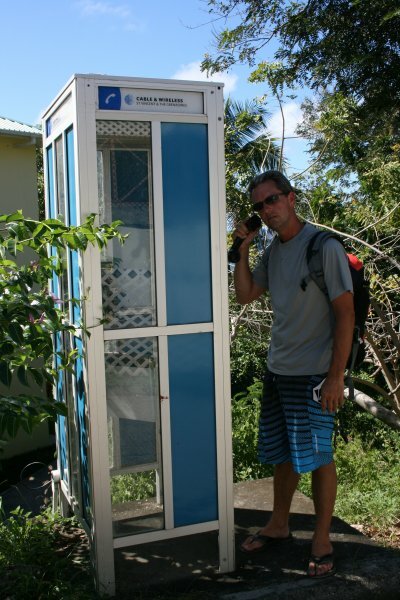 After gathering on Hotel California, Matt quickly became acclimated. He was put in charge of organizing the huge pile of dinghy’s that brought everyone out to the boat, securing them on anchor so that we could retrieve them when we returned. 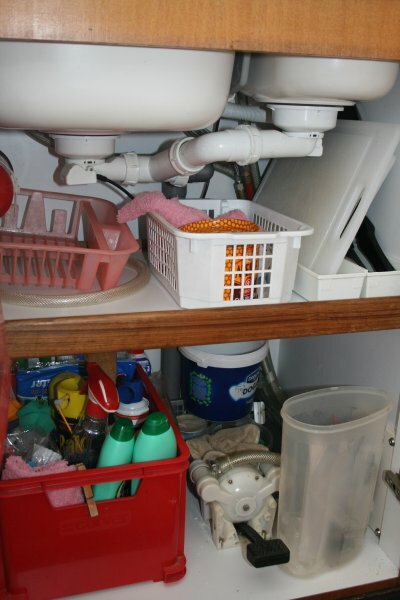 We had our 101 on the boat, which is about 27 years old and has a few quirks. Steve, is at the helm, Annie is the tactician, Matt and Eric worked the main, Anna and JJ were on jib, Bill is at the bow, I am on the preventer (and rail meat), and everyone else is ballast (aka rail meat). With jobs assigned, dinghy’s secured, main raised we headed to the start. We Were in a class of 7 boats (CSA 1). The starting line and finish line are always the most tense, so all was quiet as we listened to Annie give Steve instructions and off we went. The first race had a lot of tacks! Which for our non-sailing friends, means turning the boat into the wind and grinding in the sails on the other side of the boat. Which means Matt had to grind, grind, and grind a lot this day and I had to scooch back and forth across tracks, blocks, cleats and various other boat pieces each time we tacked in between the other 12 people on the rail. The sun was shining, the water was blue, the mood on the boat was a bit tense as we were not allowed to chat and there were a lot of people on the rail trying to get over at the same time. But, we finished 3rd (corrected time) and we were pleased! Even though everyone was tired, we shared a few cold ones and talked about the race before heading back for showers and the party. Have to admit, Matt and are used to “cruising life” and racing was a totally different story. Everything hurt. But, we managed to make it back to Hotel California for race day 2. 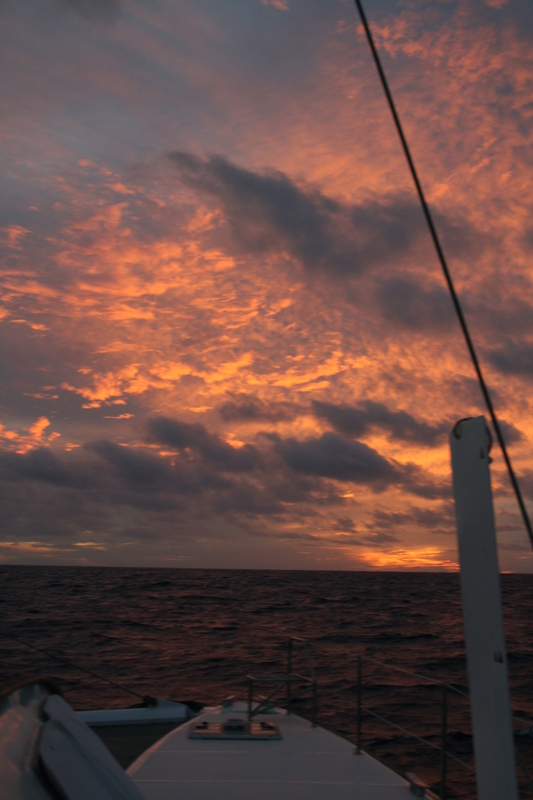 We had lost a few crew members, which was good only in that we had too many people on the boat on day 1. As we headed for the starting line, everyone begins to jockey for the best position to cross – always a little tense, but we had a good start (thanx to Annie). 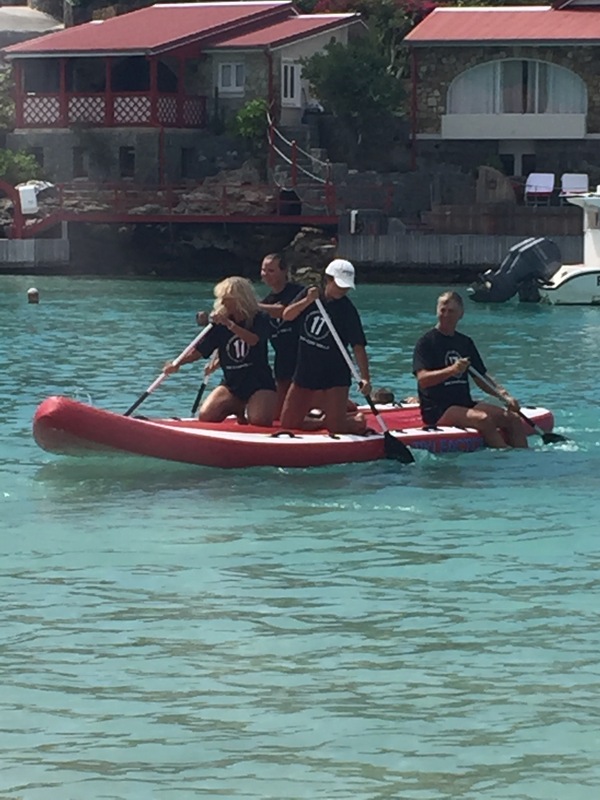 However, not long after we crossed, we were coming down on a smaller boat in a different class, Kickem Jenny (a melgas 32′) from St. Maarten who we know from the Heineken Regattas. We are a much bigger boat and harder to maneuver, but they were on a starboard tack and had right of way. They did not hear us, their team was distracted, and did not see us until it was too late and the shouting began. We did not come into contact, but we did force them off course which forced us to do a 360 (race rules because we were at fault). We later found them to apologize, but frankly it could have been handled much better. We corrected our mistake and continued the race which was a much easier course as it had a lot of downwind runs – not good for our type of boat with no spinnaker, but a lot easier on the crew. We ended up finishing 4th on day 2 and off to the party to celebrate. They call it a rest day, but it is actually a huge arse party over at Nikki Beach. 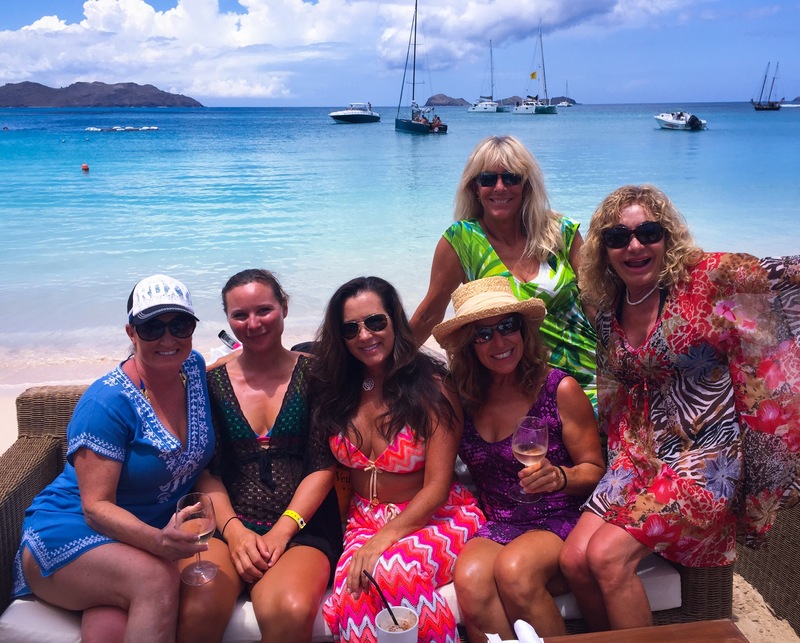 Several of us joined El Gato and we motored over to the other side of the island for the day. I have to say, Les Voiles knows how to throw a party! Not only are you at Nikki Beach having a $10 bottle of water and $50 lunch (which was actually pretty good), but you are on one of the prettiest beaches in the world. 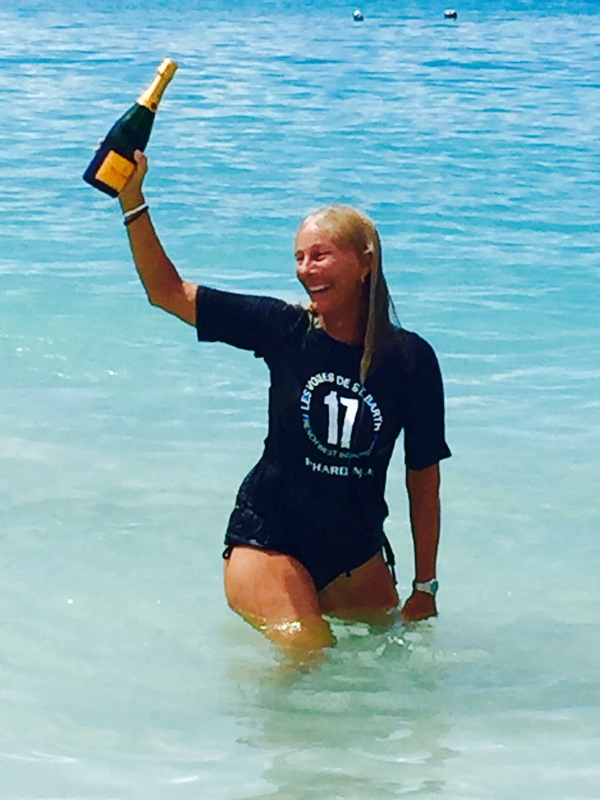 The regatta hosted a few games including a treasure hunt where 10 bottles of Veuve Cliequot champaign were buried under water (and 16 people searching for them). Annie was the proud recipient of one of the bottles – YEAH Hotel California. Next up was the giant stand up boards where a team of 5 try to knock off the opponents using a boxing glove on an extended pole. Unfortunately, our eager beaver commits 100% and fell in on a jab, but we had a great time playing and got to keep the memento t-shirt! It seems each day of the race we return to Hotel California with even fewer people. Today we had about 11-12 people. Now, we have the dinghy process down, raising the main, heading to the start and preparing for a new race. One of the many great things about Annie our tactician is that she is very positive and keeps everyone well informed about the race course, our goals, our tacks/jibes, and our strategy. This course would be slow as the wind had died down considerably, but we were ready. With fewer crew, it meant we have more room to actually work and stay safe. 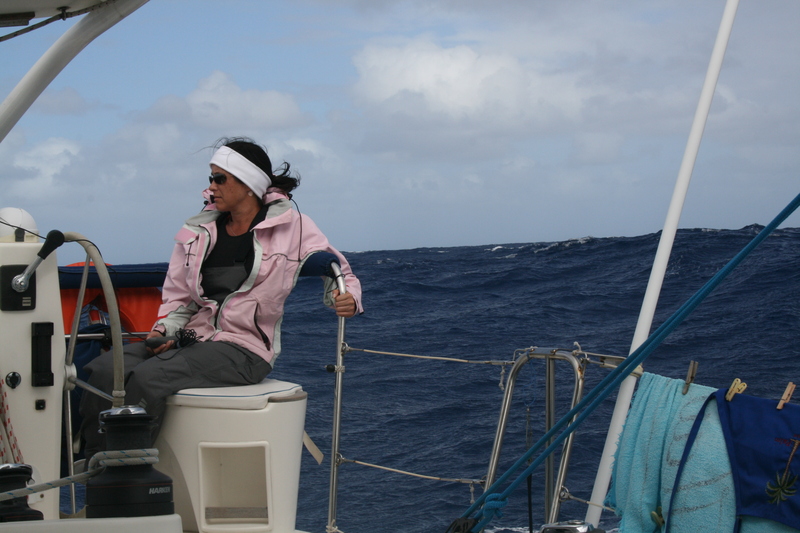 Anna, a petite young crew member who traveled with Steve from the BVI’s was an extremely hard worker. She tailed in the jib which is a heck of a job! But, unfortunately, not 45 minutes into the race, she pulled a muscle in her back and she was in extreme pain. So, we laid her down, iced her up, gave her some Advil and I was trained on the jib. I have to say it was much more exciting working the jib than being on the preventer and on the rail. But it was hard work! The good thing was that it was low wind, not as dangerous had it been race day 1 or 2 and the boat was moving slow. It took us over 7 hours to complete the course. We were afraid we were going to be disqualified because we would not cross by the 6p deadline. Many boats turned their engines on and dropped out. But, we persevered, crossed before 6p and came in 3rd in our class. Sweet! Working the lines in the cockpit–so serious. Today was predicted to have little to no wind, so we were checking the website and had a few people on shore with the race committee to see if the race was to go on. It was postponed a few times, before finally being cancelled. I have to say, I was a bit relieved. 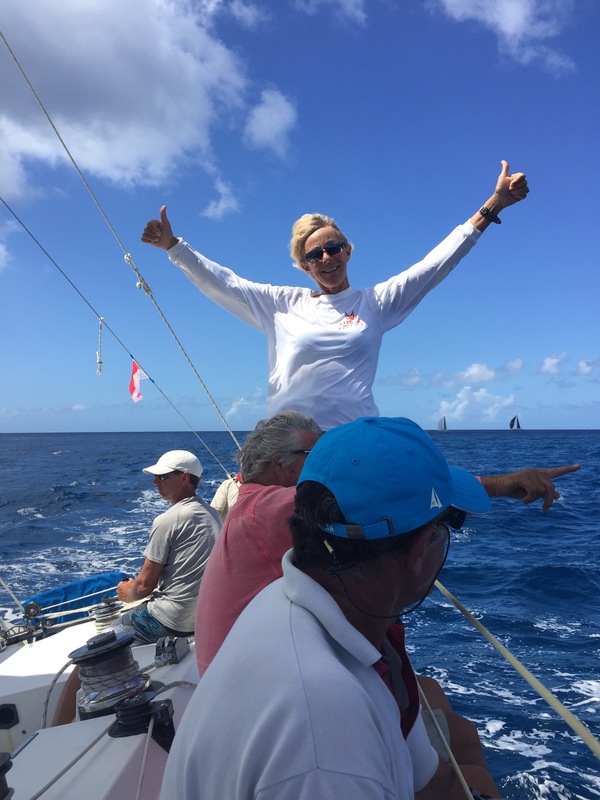 Anna was on our boat recovering (as we have a cat and it is easier to rest on a bed on Sugar Shack then a monohull rocking and rolling). After watching Regatta Guru, and adding up the points, we realized we were in 2nd place in our class. Spirit was disqualified on day 2 because they made contact with another boat and did not do a 360 (plus they had a protest for un-sportsmanship conduct) and another boat was penalized because they crossed over the start line too early and did not do a 360. You are probably wondering how the results are calculated, right? The lowest score wins, so if you are 1st place you get 1 point, 2nd place, 2 points, 3rd place three points and so on. If you are DSQ (disqualified), you get a point for every boat in your class plus 1 (so an additional 8 points in our class). Ambersail who came in 2nd each day, had 1 DSQ because they started too early and did not do a 360. Spirit had a DSQ on day 2 because they made contact with another boat and did not do a 360, so even though we technically crossed the line 4th each day, we ended up the the 2nd lowest number of points. Consistency and sportsman like conduct pays off I guess. Annie talking me thru a tack while trimming the jib. We were thrilled, shocked, excited and amped up to be up on the podium! 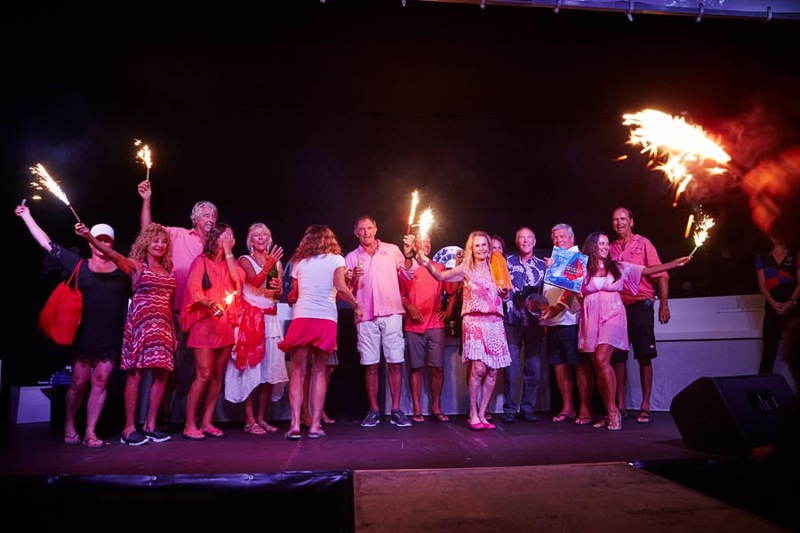 First they gave each boat a bottle of Veuve Cliequot champaign (we got a giant bottle because we had a lot of crew) and Anna got to go up and receive it – CHEERS by all! 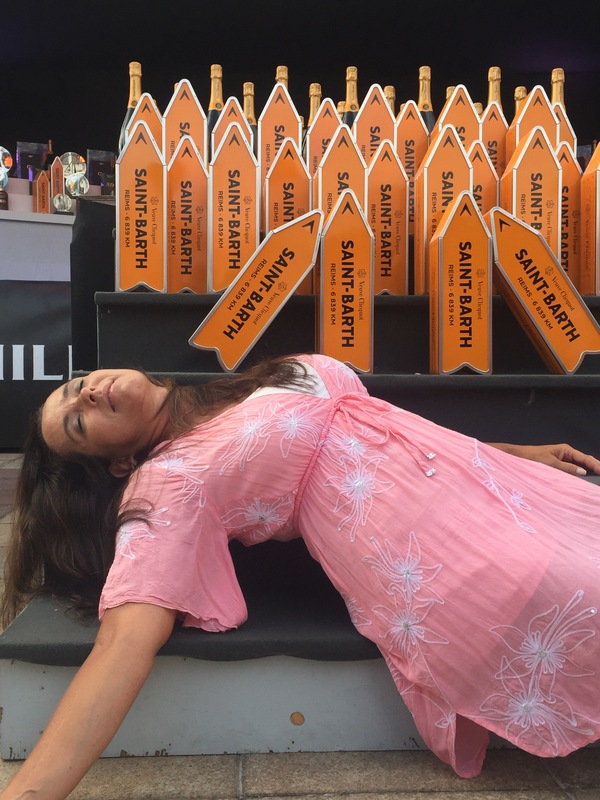 Then we had the pleasure of going up on stage for our 2nd place trophy, a grand St. Barth’s Book, another bottle of champagne (they were a sponsor), a bottle of rum, and a few other things. We brought up fireworks and lit them as we got on stage and posed pretty for all the cameras! Sweet success. I’d like to tell you about the rest of the night, but there was a lot of celebrating, tons of hugs and two cheek kisses, and then pizza to sober us up. This entry was posted in Caribbean on April 22, 2017 by Christine.